Christmas is getting closer! But Santa left the Christmas Elf without the toy making instructions. 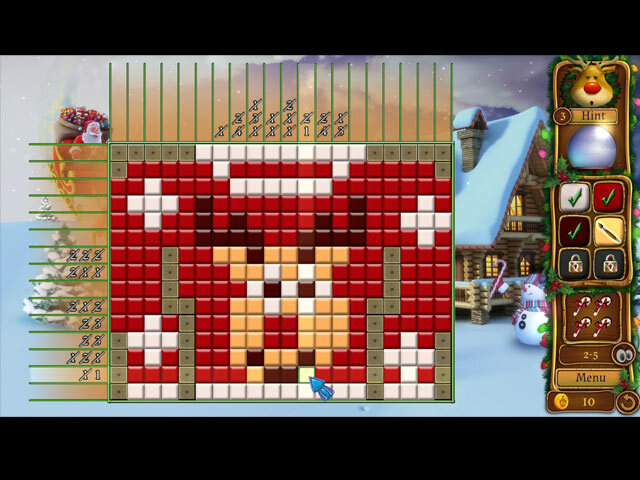 Help the elf by solving festive mosaics puzzles. During your stay, find elf coins and build the Christmas village! 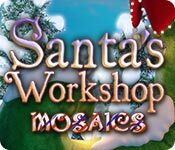 Santa's Workshop Mosaics is rated 2.9 out of 5 by 12. Rated 5 out of 5 by codester9 from Get in the Swing with this Jazzy Soundtrack If you're not yet quite into the Christmas spirit, this game will put you right in the perfect mood. It's an enjoyable griddler, but what puts it over the top is the wonderful jazzy soundtrack! I couldn't stop playing...my trial hour ran out just because I was loving the music so much. It reminds me a bit of the wonderful Vince Guaraldi soundtracks of the early Peanuts TV shows...jazz piano, played with joy, humor, and a lot of love to accompany your holiday fun. I have a small complaint with the fact that instead of getting progressively more challenging, the puzzles slip back to simple (boring) 10 x 10 squares off and on after playing 20 x 15 squares. Not sure why it's not steadily progressive, but it's a small complaint. And the music more than makes up for it! Highly recommended. Rated 5 out of 5 by biscuitsmama from I LOVE THIS CHEERFUL, CHRISTMAS GAME TO START OFF THE HOLIDAY SEASON! 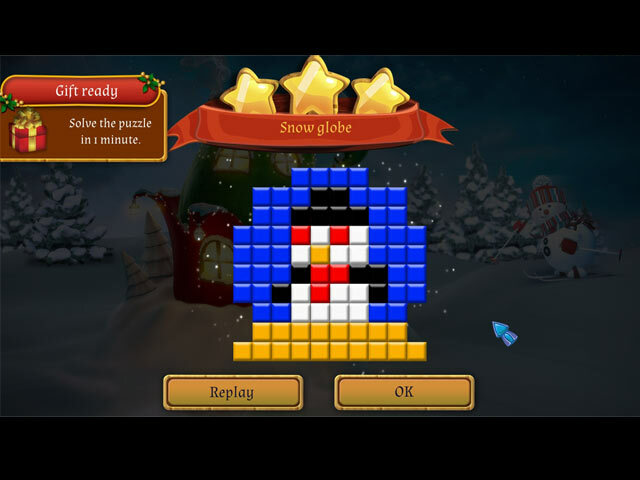 Santa’s Workshop Mosaics is the second holiday themed game from this developer that has come along in recent months. I purchased their Halloween game Far Kingdoms Spooky Mosaics in October and enjoyed it so much that I have now played through all of the boards three times so it is a terrific surprise to see Santa’s Workshop this morning. I imagine that I will play this game just as many times during the Christmas holidays especially when I need to take a break and put my feet up for a bit. When I started the game I was amazed by the gorgeous, crisp graphics that are full of brilliant color. Not only are the graphics excellent, the accompanying Christmas music soundtrack makes this a perfect Christmas game. When you begin the game you will see an option in settings – “Cover” – that will allow you to select different tile sets. For now I am playing with the original tile set but will experiment with others later. Another thing I like about this game is that I can choose to play the game in the casual mode where I don’t have to play beat the clock. I dislike any game where I must complete a task within a set amount of time or lose “stars or points” so I appreciate being able to select the casual setting that allows me to complete the different boards at my own pace. As you play you will earn coins that can be used to purchase items to decorate Santa’s Village. I have had so much fun with the Halloween game and have changed the spooky landscape several times so now I look forward to setting up my little winter wonderland. I love the mosaic type puzzle games in general and several of the penguin family games live in in my GM all the time. It has been great to see that in the past year there have been other mosaic games that are just as terrific. For now I look forward to seeing other seasonal mosaic games from this developer. Actually I am hoping that they produce more mosaic games in general because they such great little games and are a great alternative to playing HOPA games. Amazing job Lazy Turtle! Your games are awesome. Rated 5 out of 5 by pennmom36 from LEAVE IT TO SANTA TO BRING SOME OF THE MOST BRILLIANTLY COLORED MOSAICS TO SOLVE USING LOGIC!!!! Tis the Season, and the Elves are working overtime in Santa's Workshop, bringing us some of the most brilliantly colored Mosaic Puzzles I've ever seen! You can choose between 9 different tile types, and I choose the metallic style, which really made these vibrant colors pop. I've played just about every Mosaic Puzzle offered by Big Fish, and I can honestly say I've never seen a puzzle with such shiney colors ever before, you have to see it to believe it! The best part is that every puzzle can be solved using LOGIC! You can play in a Casual mode where the numbers are crossed off one by one, or Advanced where the numbers are only crossed off when a column or row has been completed. The object of a Mosaic Puzzle, is to either fill in or cross off the cells, as indicated by numbers located on each column and row. Each group of numbers must be separated by at least one empty or crossed off cell, and sometimes it's easier to cross off cells where you know a filled in cell can't possibly go. This will narrow down the field, and switching between colors also helps solve the puzzles by narrowing down the field. Left Clicking will fill in a cell, and right clicking will cross off a tile, and you can switch between colors, by clicking on any of the 6 color bubbles located on the right side of the grid. Each grid is different, some are small, some are large, some are squares, some are rectangular or oddly shaped. Each picture will create a toy to fill up Santa's Bag of goodies for all the good boys and girls, so you'd better be good, for goodness sake! When the demo ended (naturally just before I completed a puzzle!) I was so engrossed in the game that I forgot it was just a demo. When this happens, I know it's a winner, so I've already bought it, and if you're a Mosaic fan, you should definitely add this to your collection, enjoy! Rated 4 out of 5 by CyndiLouWho2 from Fun-to-Play game, but the music not so much I played this game a couple of weeks ago when it premiered on another game venue, and totally enjoyed it except for the music. GOOD STUFF: * Various palettes of colors to choose from while solving * You don't get penalized for using the hint when it finally charges up, but it does take quite a while for it to fill up * The game is 99% logic driven * The little wise-cracking elf is adorable * There is somewhat of a story line and you get to purchase materials so the elf can add buildings to the North Pole landscape * All the grid solutions were pictures of toys which you were helping the elves make THE ONLY BAD THING: It was great having Christmas-type music to listen to while playing a Christmas themed game. However, the music was on a short loop and the same two songs played over and over. To make it worse, there was a loud screeching trumpet blast that lasted just long enough to grate on my nerves. So, I ended up turning off the sound and had my MP3 Christmas tunes playing instead. It's a fun game if you love griddler mosaics and I highly recommend it! Rated 3 out of 5 by 29526 from Colors are awful I did not buy this and, in fact, stopped playing after a half hour in the free test mode. The color palette is terrible, it is hard to decipher between the shades of greens, blues and grays and there are many blocks that use white, which is the same as the background color. I really hate the word "combo" after playing this game as it pops up constantly and blocks the screen. I love mosaics lately but this one was not very good, I am disappointed. Rated 3 out of 5 by dachsy from Great Until I Found a Board That Couldn't be Played with Logic This would have been a five-star game as most aspects of it are superb, but playing on the harder mode, I found the seventh board was not completely solvable with logic. I had to use hints to finish it. That is a deal breaker for me. In my mind, these games should not be available for sale if the logic factor is not proven. I can't recommend a mosaic game if this is not so. Rated 2 out of 5 by llast from A ripoff I love nonograms and always search for new ones. While the graphics were nice, I finished it in 2 days! Not worth the money, even at a discount. They should give it away for free. Rated 2 out of 5 by verimeri from Good but.... The puzzles were well done. 98% could be solved with logic. The developer did seem to be very fond of the checkerboard, that got old. The other aspects of the game were lacking a lot. The only way to go to the village to build a new structure was to exit the game and return at which time the village tab would show. There are no power ups, just a very stingy bit of hints. Often, I would have to click on a color multiple times before it would switch. Little things? Yes, but annoying. Needs to be improved before I would say buy it. Rated 2 out of 5 by ekaska from Too basic Title says it all. Put out too quick, too basic and the sound effects are annoying. Rated 2 out of 5 by geniegal from Based on a few demo minutes I LOVE mosaic puzzles, but this one has a number of flaws. I turn off the music since I need to hear what is going on around me, but this game insists on providing me with a musical chime or two every time I add a row. Next the game is very slow to respond whether adding a square to a puzzle or clicking on a button to handle so type of game management issue. The "hot spot" on the buttons is very small compared to the size of the button and it takes multiple clicks to find the "hot spot". 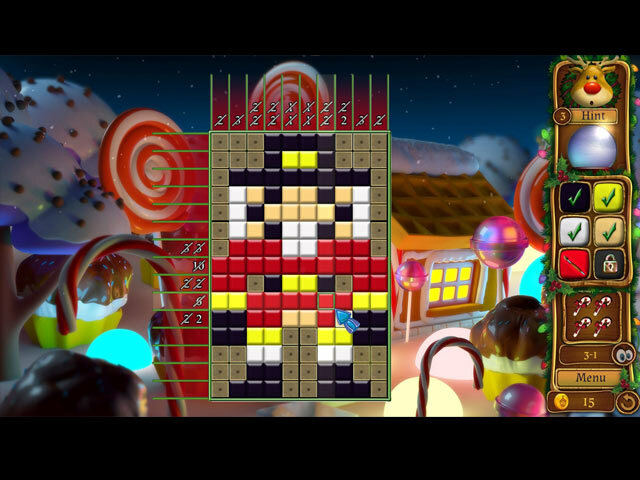 Help the Christmas Elf make toys for the holiday in this festive mosaics game!